In the spirit of giving and celebrating Chinese New Year, and mostly to thank all you wonderful readers for reading, Everything Sweet will be giving away one Kim Jong Kook Official Calendar. 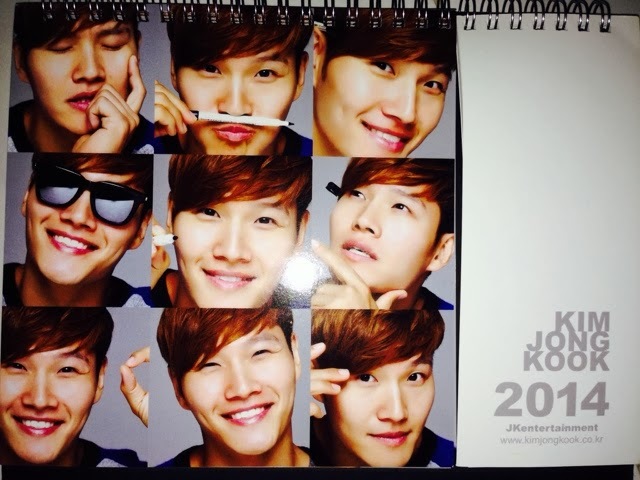 So want to have your very own Kim Jong Kook Calendar? To increase your chances, please like our Twitter and mention @SweetDramas why you want this calender! 3) Tell us here in this post your username for entry and why you deserve to have this calendar/how much you simply adore Kookie! It's that simple! So what are you waiting for? Join now and stand a chance to win a Kim Jong Kook Official Calendar! *Giveaway is open to international readers and the winner will be notified by via Facebook or Twitter (depending on entry method). Thank you for your support and Happy Chinese New Year! Kim Jongkook, my bias in Running Man!! Because of him, I did crazy stuffs which I hadnt done before (like going to the airport and fanmeets despite the crowd!!) And I was not into Korean stuffs until I watched Running Man! I totally fell in love with his voice ever since I listened to his 'loveable' and 'Today More Than Yesterday'! It was a pity that I missed the buying dates for this year's calendar!!! So I want it very much hehehe!!! Wishing Everything Sweet a happy chinese new year!